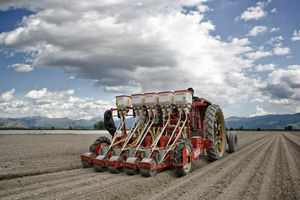 The Maschio ORIETTA vacuum precision planter for vegetables . 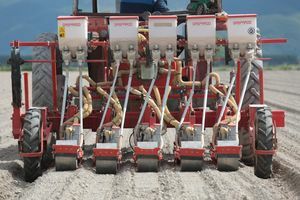 Many operators are looking for a cost-effective planter that can capably handle the wide variety of planting conditions encountered on their operation. 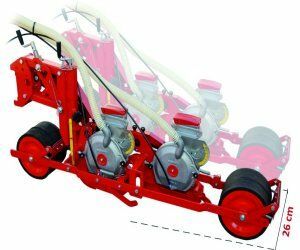 Thanks to the wide range of sizes and options, there's an ORIETTA row unit perfect for every field and veggie crop. 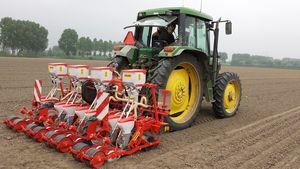 The single, double, triple or strip row configurations placed in a narrow (N) or wide (W) Orietta row unit version match every row spacing and plant populations. 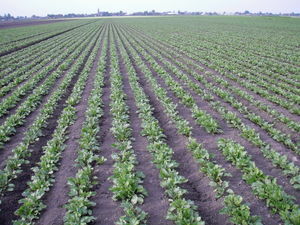 The N row configuration allows minimum inter-row spacing of 5½, 2¾ and 3 inches with the single, double and strip rows, respectively. 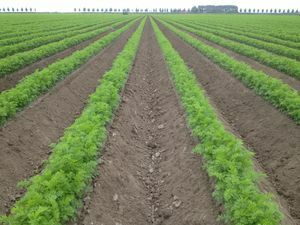 On W row version the minimum row spacing is 9, 6¼, 6¾ and 5 inches with the single, double, strip and triple row shows, respectively. 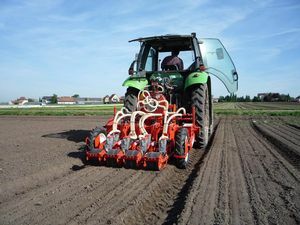 Adjustable seed covering system: on the field, without the use of tools, you can easily rotate the seed cover by hand to adapt furrow closure to the soil condions. Vacuum disc cleaning and emptying system: Vacuum is created by a PTO driven vacuum blower. 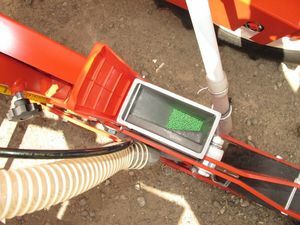 The use-friendly sliding knob lets the operator regulate the vacuum level depending on the veggie to be planted. 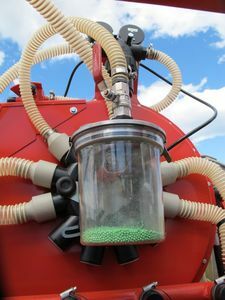 The vacuum emptying system allows you to easily clean out the hoppers and distributors from unused seeds. 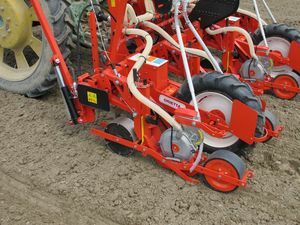 Gearbox and transmission wheels: large diameter drive-wheels are adjustable on height in order to lift up the toolbar when planting on raised bed. The 36 ratio gearbox provides an infinitely variable population settings (from ⅕ inch and 21 ½ inches.) which allow the operator to achieve the picket fence stands that competitors do not offer. 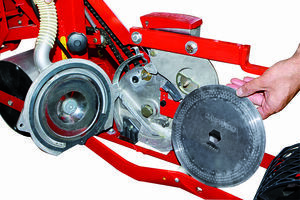 Parallelogram connection and press wheels: each row unit is mounted on sturdy parallelogram linkage in order to provide great vertical travel and minimal twisting and bending effects. All pivoting points feature with self-lubricating bushings for maintenance-free performance. 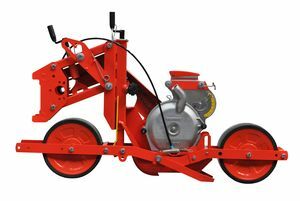 The 10 inches diameter front and rear press wheels are connected by a self-balancing system to follow every soil profile and minimize depth variation. Large diameter seed plates: the stainless steel seed disc can have a single, double or triple row of holes with a wide range of hole number (up to 180) diameters (from .02 to .12 inches) for every seed size from lettuce to cucumber. The discs have a large diameter and they rotate more slowly than other vacuum meters improving spacing precision and reducing parts wearing. 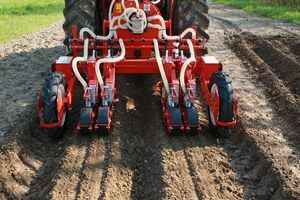 Double Singulator System (DSS): the cast-alluminum distributor equipped with the Double Singulator System (DSS) that delivers one seed, and one seed only, from each meter disc hole. 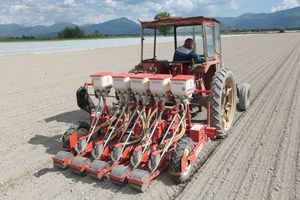 The Maschio OLIMPIA vacuum precision planter for vegetables. 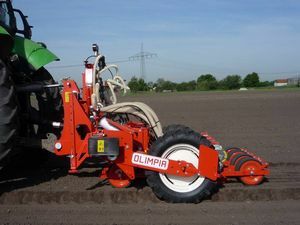 The OLIMPIA unit is available in N (narrow seeding planting unit) and W (wide seeding planting unit) versions. 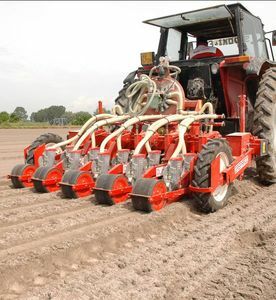 The N configuration allows minimum of 10 inches between the elements and from 1½ to 3½ inches between the rows, or mimimum of 2¾ inches between the rows with seed press wheel. The W configuration allows minimum of 8½ inches between the elements and from 4½ to 5 inches between the rows. Coulters: To be accurate, you want a smooth, consistent slit trench. That’s why we equipped the shoe with a front reversible cast-iron coulter. 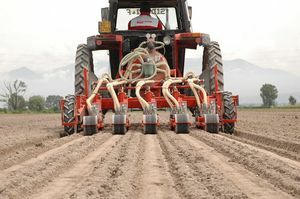 Reversing the front coulter operator can set a shallow (0.3 inch), intermediate (0.6 inch) or deep (1 inch) seed placement. 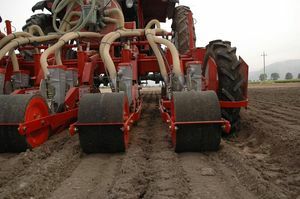 The shoe features with long sides plates in order to firm both sides of the seed trench.